Horsepower sells, but a “streetable” and dependable custom motorcycle it does not necessarily make. 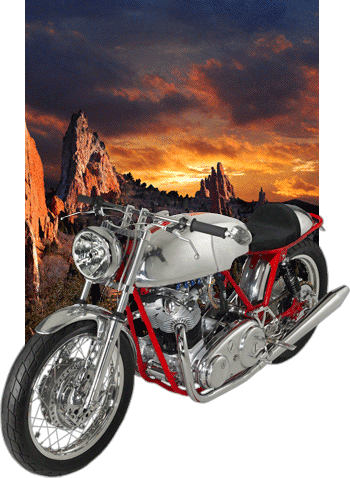 The purpose of Colorado Norton Works’ motorcycle engine rebuilds is to get Norton Commandos on the road and keep them there. Improvements to head flow and more aggressive cam profiles are certainly possible, but too often improvement in one area can only be capitalized upon by improvement in additional areas. To arrive at a well-balanced engine, the “domino effect” of these improvements usually drives expense to an excessive level. However, at cNw, we carefully plan and apply all steps in the motorcycle engine rebuild process. Through this attention to detail, we deliver a machine that is balanced from the very core and up. With the cNw Norton Commando motorcycle engine rebuild, our basically stock engines are smooth and precise, capitalizing on the low end and mid range torque that these engines are known for. It’s just part of our overall Commando motorcycle rebuild service. Rods inspected, appropriate repair of nicks, etc. cNw continuously tries to improve on the Norton Commando rebuilds we offer and any of the above may change through the course of your build, however rest assured that its only to make the machine that much better. © 2012 Colorado Norton Works. All Rights Reserved.